Hello Friends and Lovers! As you probably already know, South by Southwest 2010 rolled through Austin like a freight train filled to the brim with free food and booze. Of course, the TastingBuds took full advantage. Other perks of being in Austin during SXSW include catching amazing concerts and spotting celebrities in town for the week. 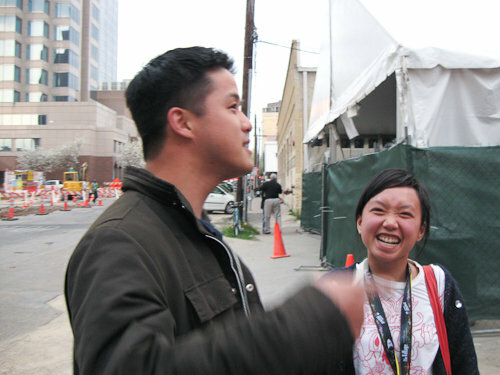 This SXSW, Peter caught up with Thu Tran from Food Party, who just happens to be one of the TastingBuds’ favorite food show stars. Thu and half the cast of her show, Food Party, rolled in unexpectedly to the Austin 360 Food Blogger Bash literally about 2 minutes after Peter was thinking “man it would be cool if Thu Tran is coming to this party”. What’s that they say about thoughts becoming reality? The conversation was short and sweet (like Thu) and Peter told her that she should try the Ice Cream Man’s Pineapple Basil Popsicle (which is strangely delicious). Thu said that it was good, and it might go good with some fish sauce. Thu also said that she was surprised that someone in Austin, Texas actually recognized her because it’s rare that she gets recognized at all. We’d like to add that show features creative and hilarious food recipes, corny puns, awkward humor, talking French Baguettes, symbolism referencing the inner struggle within us all, and the secret ingredient… LOVE. You can watch the original pilot for the show in the embedded video below and you can find several early episodes of Food Party on Youtube. The new season of Food Party starts on April 27, 2010 and it airs on IFC.